Polly Corner – Maynards Bore – Finke and the FINISH! From Polly Corner, the plan was to backtrack for 6km, almost to where we turned on to that track (towards Horseshoe Bend) and then head south along a station track to Cliff Bore on the river. Just as we set off we were met individually by Tanya from Lilla Creek Station, the person whom I had been introduced to through the Alice Springs School of the Air. I had hoped we would have time to drop in to the station, the homestead about 30km off our route. Tanya however, had been sent to see who was camping on their land (her uncle had spotted our fire the previous evening). When she realised who it was, all was fine. Her daughter (year 4) was very keen to see my bike and asked a few good questions. Turning south, the track bisected a few red sand dunes before we joined a more major track, with a firmer surface. The way to Cliff Bore looked not to have been used for a very long time and I took the decision to continue on the track, that ran roughly parallel to the river and no more than a few kilometres away. It was further in distance, but significantly faster. Just after our lunch break, near Clough Bore, a station hand, out checking waters stopped by to see if we were OK. Obviously the word had got around that we were there, thanks to Tanya, so they were just keeping an eye on us to ensure we didn’t get into trouble (much appreciated). The last few days have been pretty warm, with varying degrees of stormy-looking cloud cover. The flies were out in force too. It was thirsty work passing along some of the tracks, especially as I approached John’s Well on Lilla Creek. The creek area was incredibly soft and blanketed with a thick layer of powdery bulldust. Lille Creek was a substantial waterway, about 150m wide at the crossing. The sand was much coarser than the Finke’s, I guess because it does not have to travel so far. On the far bank, a huge river gum had fallen across the track. Bob decided to give the station a hand and removed the obstacle, cutting the trunk it into pieces with his chainsaw. We continued across the vast, open landscape (I love the openness) eventually to Maynards Bore. The diesel powered bore, beside the Finke, had excellent water, with a small hose and tap, so we took it in turns to have much needed wash. I had made up such good progress that reaching Finke a day ahead of schedule was going to be very achievable. I was sore and tired, but excited about my pending arrival the next day. I was pretty excited to reach the final day. The chill in the air has long gone and it is warm enough to just wear my cycle kit first thing in the morning. After the obligatory team photo, I set off in the sand, away from Maynards Bore, then turning east. 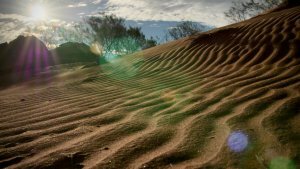 The first few kilometres were fine, but then the track veered away from the river and into some horribly sandy country; deep sand, bulldust and corrugations with little option but to stay on the tracks. Mixed in was some spectacular breakaway country. I tried not to think just yet about the finish because there is always a sting in the tail. Quite a lot of the route was worse than the riverbed to cycle on! I had a small break after 13km at Clough’s Bore, where the old telephone line posts still stood. The next 15km took an eternity to reach Beer Street Bore, back beside the river bank. 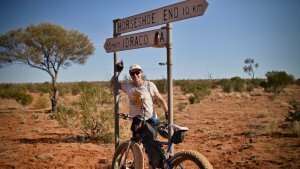 After one final interview by Brian, I set off along the river for the final five kilometres to the Old Ghan crossing, which is what we decided would be a suitable finish point. 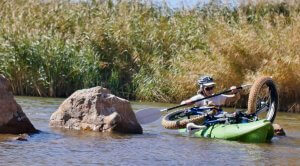 I was expecting the usual struggle, but the surface of the riverbed was the best it has been for the whole journey! For most of the way a layer of undisturbed clay (no hoofs or vehicle tracks) covered the sand, allowing me to ride the final kilometres relatively easily. Bob drew a line in the sand and waved the finishing flag – one of his checked shirts on a stick! It was a great moment and a fitting way to end such a special journey. Just ahead of us, the annual Finke Race was in progress, with motorbikes virtually flying from one bank to the other. I then had to pedal past all the race-goers for the four kilometres into town. I waved to quite a few bemused looks! The air was absolutely thick with dust. 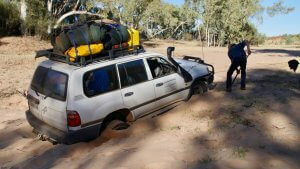 The mayhem was quite surreal after the remote, peaceful journey we had just completed down the mighty Finke River. We didn’t hang around the town of Finke as there was nowhere to stay and a shower and clean place to stay was in order. We packed the bike and gear into the Land Cruiser and drove for two hours across to Kulgera on the Stuart Highway. Tomorrow we start the long journey driving south. There may be one more post when I have time to sum things up. We were interested to see how far we could go on the newly bulldozed track we had followed to the campsite the day before. 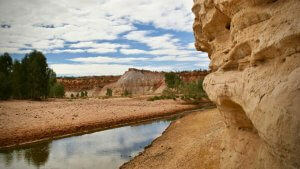 From the Finke River bank, where we camped, the track was an absolute mess of bulldust and deep, loose sand. For about three or four kilometres, I really struggled over a confusion of white and pink sand dunes. The track veered northwards, though we wanted to head east towards Danny White’s Yards. With no option but to continue along this track, the route started to bisect larger red sand dunes (more coherent sand for me) and through some beautiful stands of desert oaks. I could hear the breeze rustling through the oak needles, similar to wind through a pine forrest. After 10km, the track joined a better quality station track that connected to Danny White’s Yards (in the centre of a loop in the river. After 6 km we turned back on to the river. About 3km later we came to Arowie Waterhole – it was different from the pools, probably fed by a spring because the water was clear with a variety of algae and small fish. It appeared to have a healthy ecosystem. We took some water from it (for washing, not drinking) and moved on. We crossed back and forth over the river, electing to ride over some more solid clay pan type soil where possible. For lunch we are down to white bread, processed cheese and I sliced up some olives to make my sandwiches more interesting! The afternoon session was the horror session for the day, crossing red sand dunes that were covered with dry scrub, acacia and huge spinifex plants. It was a huge driving effort from Bob to get through this, his vehicle scratched and covered with sticks and dust by the time he got through. It was no better for me. I had to follow his tracks, which wasn’t very easy; sand, heat, flies, scratched from bushes and spinifex. I somehow avoided getting any punctures with sharp sticks a real threat. In the end we didn’t really cut off any significant distance. The landscape was parched; there were sections of dead trees and on a claypan, two dead horses. 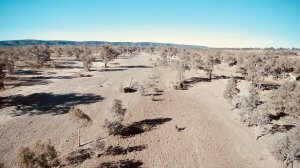 We rejoined the Finke at the point where the Hugh River, another significant river, enters it. At times of rain, this must inject a whole lot more force to the already vast torrents of water. The final stanza for the day began by Bob becoming bogged trying to cross a sand mogul. Confident of getting out, he waved me on and I cycled the final 4km down the middle of the river, and across a broad sweeping bend to Junction Hole Waterhole. The site was beautiful; not much water left in the waterhole, but the rock formation was really interesting, with white ochre on the bottom layer and a conglomerate of sandstone with all sorts of river stones embedded into it. In a cove behind the rock, a grassy terrace, perfect for camping. 43km done. I am starting to feel pretty tired now. My body has taken a beating every day. My legs feel heavy and I don’t feel as strong as I did at the start. Still, I need to hang on and cycle consistently for at least 40km a day for the last four days. We are getting there! I set off alone, as was usually the case, this time leaving Brian interviewing Bob for the documentary. I made great progress following cattle tracks along the banks. Sometimes there are soft sections, or branches blocking the way, but generally it is one of my best options, while they are there. The river though, is constantly changing, throwing up new obstacles and wonderful features. Every day is different! After the guys had caught me, about 15km from camp, we came to one of the most magnificent features so far, near Lalgra Yard. Majestic white ochre cliffs, maybe 25m high with a thin layer of red sand/clay and rocks above. This has to be a place of cultural significance. Bob and Brian found flint-like cutting implements fashioned from the hard stones at the top of the cliffs. The ochre is soft and chalky. 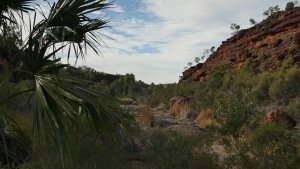 The Finke/Larapinta has been used as an Aboriginal trade route for tens of thousands of years, and surely this would have been an important place for them. I really battled over the next ten kilometres in the heat through the sandy river banks to near Davis Well and a lunch break. The good news was from that point, there was a track we could follow which enabled me to catch up some distance and save my legs a little. Tonight we are camping beside Polly Corner, of course beside the river. 44km done. We have roughly 110km to do in the next 3 days, to get to the town of Finke. It should be very achievable at our current rate, but none of us are getting complacent. Into the second week, and there is still a fair bit to do to get to Finke, but I believe it is achievable. A pack of dingoes awoke all of us at 4am, probably a kilometre or so away. The morning chill is still with us. The river and surrounds is just about all sand now, patches of stones are few and far between. The plan was to cut across some of the bends in the river to make up some distance, but driving and riding cross-country out here is a challenging task. We were often winding through sand dune territory, covered with dry scrub and sticks. It was really heavy going for me because I mostly had no choice but to follow Bob’s tracks which were soft loose sand. 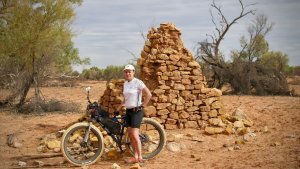 The second cross-country section was over spectacular red sand dunes, through a grove of desert oaks and spinifex, reminiscent of my journey up the Canning Stock Route, but without the heavily corrugated track. After lunch, Bob and Brian went ahead, all the way to the Central Australian Railway crossing. In this situation I could not deviate too far from the vehicle tracks as I needed to know when they turned away from the river. I often wanted to head to the river bed because the sand regularly appeared quite often pure and rippled by the wind – a better surface for me to cycle on. I have also started to follow animal tracks along the banks as they can be a reasonable option. However, it is generally better for Bob to stay off the river bed and the lumpy moguls along the side as much as possible to avoid becoming bogged. 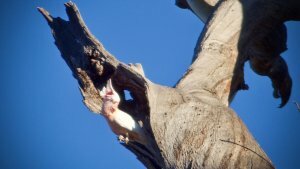 He prefers to stick to the trees beside the river, which is often loose sand and rough because of animal hoofs. As a result the afternoon was a long, slow grind for me, following the vehicle tracks. There isn’t any other option though. I lost the tracks towards the end of the day, but eventually connected via the CB radio and made it to the railway crossing in good time. We decided to camp there, my minimum target for the day. 40km done. Two freight trains passed overnight, one from each direction. 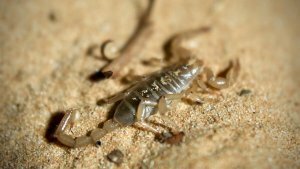 There was also mob of brumbies galloping around at night, and Brian saw another dingo. I set off along the river towards Idracowra Station and really enjoyed pedalling down the middle. The sand is always changing, sometimes reasonably firm but then gives away and becomes heavy work. Every day I am reminded how much force the water must have when the broad river flows. Enormous skeletal tree trunks, uprooted by the force of the water, lay scattered in the river bed. After 12.5km I met up with the guys who had taken a side track to that point. Bob found what looked like some ancient coral and tiny mollusc shells in the middle of the river. We continued along the track and passed Idracowra. A little further along the bank we crossed the river and then another 4km cross-country diversion over a confusion of small sand ridges to Oodratnamma Waterhole. Just before the waterhole we came across the ruins of two cottages that looked as though they had been there for a very long time. Bob thinks 1800s, but we’re not sure. During another cross-country section we came across a newly graded track, (probably made within the last year) that was not marked on our maps. After a couple of kilometres it crossed the river and then conveniently for us, tracked along the floodplain. Some of the surfaces were reasonable and other parts were incredibly sandy and blanketed with bull dust. It was a real bonus through, and I ended clocking up 51km today. I was absolutely exhausted, arriving at camp after crossing numerous red sand dunes and the river several times, just as the sun set. 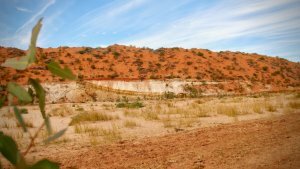 While near to the main highway, the plan was for Bob and Brian to drive up to Stuart’s Well (approximately 80km from Alice Springs) to top up fuel and water and whatever food supplies were available. They would then use remote station tracks and even a fence line track to drive to meet me at Harts Well on the river, about 25km via the river from the Stuart Highway crossing. I was slightly apprehensive, after what happened on Day 1, as Bob helped me lift the bike over the barbed wire fence and I set off on my own. 750m later there was another barbed wire fence, but this time I lifted the bike over myself. Being a well-stocked station, the whole riverbed was almost continuously broken up by hoofs making progress very tedious and slow. I tried the banks, through the trees and the riverbed. After about 6km, the river splayed out and I thought I was following a tributary. Usually I can determine the direction of the flowing water by the debris gathered at the base of the trees and other obstacles, but there was no evidence at this point. I thought I was going in the right direction and followed the channel for maybe 1500m. Once I passed a small waterhole, I started to see debris hooked on the vegetation and worked out I was travelling in the wrong direction. I followed the creek line in the direction of flow as indicated by the debris and ended up back at the beautiful Snake Waterhole on the Finke. From there I won’t make the same mistake. We had a communications plan that entailed Brian checking in with me on my satellite phone every hour while we were apart. I would have to stop and fire up my satellite phone to receive Brian’s BGAN message. They were also able to see where I was on the SPOT tracking map on my website, and I would also press ‘check in’ on that device to show exactly where I was. It was a serious effort to get across Henbury Station country due to the number of cattle and frequent waterholes. It is a beautiful station though. No need for fences because to muster the cattle they would just have to concentrate along the river environs and it’s strings of waterholes. We met up successfully at Harts Waterhole at around 2.30pm. Then just after we set off together, Bob got bogged. He waved me on saying they would be OK and I continued mixing it up, following animal tracks along the banks, struggling over sand and sometimes going through firmer ground just back from the bank. After covering 5km, I started to wonder where they were. Then after 9km and still no sign of them, I stopped (4.45pm). About half an hour later, Brian checked in on the CB radio, meaning they were no more than 5km away. Then, as they approached on the middle island I tried to use the CB radio to guide them in and the battery cut out. They drove straight passed and I couldn’t get their attention. It was quite some time before I could hear the engine again. The SPOT tracker gave an accurate location and all was fine. We camped on the island adjacent to where I was waiting. I now carry spare batteries on the bike! 36km done. Bob estimated it was about -3C in the early hours of the morning – there was an inch of ice covering the large water container and Brian’s tent had frost on it. Today we passed several waterholes; Redbank (where we were aiming to get to last night), Horse Camp, 15 Mile, Little Ampire and Ampire Waterhole. After Horse Camp we took a short cut overland, though technically still within the Finke floodplain. By the time we arrived to the riverbed, my 4.8 inch wide tyres had become a pincushion for more than a hundred doubles gees (or cat’s heads, centurions, three cornered jacks, devil’s eggs – depending on which state you come from). Bob and I slowly brushed them off and where the spikes had pierced the tyre, sealant spurted out and immediately closed the hole. Amazingly the tyres were fine. Next obstacle was a fence. I was easily able to get under it in the river, but Bob had to cut the wire ties, stretch the barbed wire to the ground and put something over the wire to protect his tyres. It was then a case of driving over the fence and replacing the ties. In the mean time, I continued, mostly on and off the banks. At one stage though, I hit a root in an animal track while also avoiding a low branch and came off, injuring my left forearm. It was just another graze to add to my collection, but a bit of a wake up call. My favourite waterhole of the day was 15 Mile, with a beautiful ochre cliff as a backdrop and plenty of small birds. My favourite part of today’s ride was the approach to Little Ampire Waterhole. 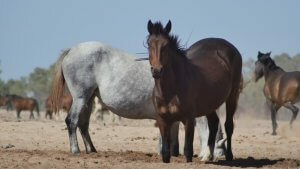 The river was one wide strip on pure sand, virtually undisturbed by cattle, brumbies and donkeys. It was these kind of surfaces that I had hoped to have more of when I planned this journey. I could move along quite nicely, without much of a struggle at all. Bob and Brian went on ahead after lunch and set up camp at Ampire Waterhole, hung out the washing (that had been sitting in a container being washed as the vehicle bumped along), and Brian set up another interview for the documentary, that I did as soon as I arrived after 37km. One week done and we are about half way to the community of Finke. The mornings have been very chilly, perhaps only a few degrees. Ay Boggy Hole the hill adjacent to the campsite blocked the sun just about until I was ready to set off. 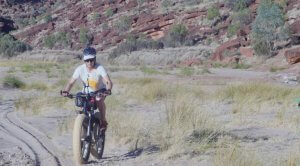 The first 30km was on the Finke River 4WD track. It cut a couple of corners, but it was still in the realm of the Finke and it will be the only time from now that we will have an easy track to follow (all relative). We lunched at the beautiful Running Water Yards Waterhole and after Brian did another interview for the film before we set off. Here we turned back on to the river. There were no tracks at all and Bob managed some very skilled driving to get across several gullies and mounds to access the river. It was particularly intense work for me because, now that we are out of the National Park and back into grazing country, the riverbed is messed up by the hoofs of cattle mainly, especially near to waterholes. Bob would go ahead and they would wait for me to catch up, but there was plenty going on for them to see. I generally followed near to the vehicle tracks, though I lost them several times when crossing patches on stones, sometimes the size of watermelons. Towards the end of the day we all spotted three dingoes feeding off a cow that a pack of them must have taken down. Another time Brian and Bob spotted a rare black dingo. The waterholes had other life too, such as pelicans and cormorants. Day 4 camp site was beside another exceptional waterhole about 6 km before No.6 Yard (as marked on our Hema map), with layers of ochre and gypsum in the hill behind, birds, brumbies in the late evening and dingoes close by. 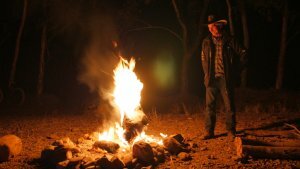 The dingoes were really active that night – Brian saw about six pairs of eyes looking at us with his torch and promptly pulled out his big microphones to try to record their choruses of howls. We packed all of our food away, but they were around our camp during the night. At 10.30pm I tuned in to six classes in North America via the BGAN to do a live streaming presentation. It was a fantastic to be able to communicate half way around the world and have students from Florida to Ontario ask questions as I sat beside the campfire. 46km done. The cold snap continues – it is winter I guess, buy it was again close to zero degrees last night. This was a very tough day from start to finish. The gorges and cliffs have gone now and the land has opened out. Still the constantly changing scenery and activity along the river bed is always interesting. It took me about 3 hours o cover 19km to lunch; a constant grind over pocked sand (from cattle) and loose stony surfaces. 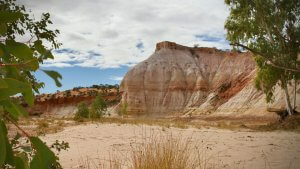 By then we were starting to see the occasional flame-red sand dune – such vivid colours that I love in the outback. Later in the day, there were more sections of virgin sand and clay-covered sand, which are significantly faster for me. I reached the Stuart Highway just after 5.30pm, arriving to a few bewildered looks as I emerged from the river bed, under a barbed wire fence with my special Christini AWD fat bike. I had lost the team for about 20mins before we connected by the CB radio. They had to divert around the fence and had then driven a kilometre down the river. Tonight we are camping near to where Greg Yeoman and I camped in 2004 during our Australian expedition. It was here that the seed for the idea for this expedition was sown. 42km done. There was a lot to do to prepare in Alice Springs before heading off to Helen Gorge for the start of the expedition. By 8.30am we were in at the famous Alice Springs School of the Air as I had set it up to give two talks to years 7/8 and 5/6. It was a very different experience from when I dropped in to the Kimberley and then the Carnarvon schools of the air in 2004 because the technology has changed. There were plenty of great questions from the students who live in remote stations, most hundreds of kilometres away. I hope the students will follow this expedition and get involved in the programme in some way. The other important engagement was to visit some Arrernte elders of the region at the Akulerre Healing Centre. There Brian and I met Amelia Turner, a local elder who was busy preparing food for a visit from Martin Luther King III’s grandson. It was good to touch base and learn a little about her culture. We were wanting to connect to find out more about what Larapinta means to her people, however the region we are visiting is the realm of the Western Arrernte and not her people. She said she really appreciated our visit to let her and her people know what we were about to do. After a speed shop in Coles, we were off on a 130km drive to the majestic Helen Gorge, 4km away from the start of the Finke (Larapinta) where we camped at the Lodge campsite. The gorge was an incredibly spectacular backdrop with red cliffs rising high above the permanent pools of the Finke River. 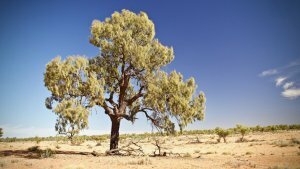 In droughts over the millennia, Aboriginal people and animals could always rely on the permanent pools to survive. One of the biggest challenges that I had already determined was how to negotiate the gorge as the deep pool fills the gorge wall to wall for about 100m. We spent about and hour or more to recce the area around the gorge to work out how I was going to get through with my bike. Scrambling up either side was nigh impossible with the bike and I was thinking I may have to start from a long way back, but then it was impossible to determine how difficult it would be to descend back down to the river. We drove out to Two Mile camp and then walked the final 750m to where the Ormiston and Davenport creeks meet – the start of the Finke River. As usual, it took a long time to make final preparations – setting up the bike and Brian interviewing me. Not far from where we were parked we found a family camping who had a kayak. They kindly loaned it to us to ferry the bike across the gorge. I set off at around 1.30pm, making the 4km to the gorge in good time. I balanced the bike across the boat, and although awkward, managed to paddle it to the far shore, drop everything off, then back again to deliver the kayak, and finally swimming back to my bike. It was an incredible experience to kayak and swim the gorge. Then it was on the bike and into the unknown (for cycling that is). The terrain was really rough – large boulders, stones, sand, grass and reeds. The sand was totally messed up by animals coming to drink from the permanent pools. I had to scramble around another permanent pool, but it didn’t present the same issues as Helen Gorge. After about 8km the valley widened and the river bed splayed out to fill it. It was difficult to tell which channel was best to cycle over often with trees and grass in the middle. Bob and Brian had all sorts of trouble firstly try to find a track marked on Bob’s map that wasn’t there. It meant they couldn’t get to the first rendezvous point that we had agreed to meet. Then, when forced to go around and along the river they were bogged several times. Bob really demonstrated his immense skills to free the vehicle. The sun had set and the almost full moon was up before we finally found each other. There were a few lessons we learned on our first day – one being how difficult it is going to be to deal with navigating the wideness of the river with multiple channels. I unfortunately lost my mobile phone, I’m pretty sure I left it on the far side of Helen Gorge. After driving another 140km to Egilsstadir, which is not far from the ferry port at Seydisfjordur, where we arrived, and still no snow riding opportunities, I was seriously considering leaving a week early, thinking we would make better use of our time back in Germany. Mike thought it worth a try to drive inland from Egilsstadir, along the north side of Vatnajokull, Iceland’s largest icecap. Some of the roads are asphalted and maintained to access the hydropower stations, just as we found on the Sprengisandur Route. About 30km from Egilsstadir, after a beautiful route beside a long lake, and definitely no snow, we ascended via a series of switchbacks onto a high plain, and yes, it was blanketed with snow for as far as we could see! Temperature hovering just above freezing, I could see the melting snow glistening in the sunshine. 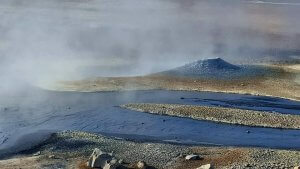 The charcoal-coloured road meandered across the gently undulating plateau; once a broad lava field with islands of volcanic rubble protruding through the snow, speckling the landscape. After about 25km we reached some snow-covered volcanoes, and as we descended to a bridge across a chasm, the road started to be completely covered with snow and Mike deemed it unsafe in our vehicle to continue. With too little time left to do any significant cycling, we returned back to the valley, and planned to return to do a decent cycle the next day (today). Down at lake level, it rained steadily overnight, and knowing that the forecast gave a 30 percent chance of rain and snow, it was worrying that the best snow cycling surface may have deteriorated. Back up the slope however, the surface was still firm under foot, even though there was evidence of some rain. We headed back over the plateau through dense cloud towards the volcano and I prepared to ride. It’s always difficult to judge exactly what the surface will be like to cycle over when on foot, but the snow seemed pretty settled and firm. I moved well on the bike, sometimes sinking into soft patches, but the surface was all cycleable. I kept pretty close to the road as the vehicle could not stray into the snow. On some surfaces the rain and subsequent refreezing caused a crust. When my wheels broke through, the crust acted as a brake. Not including a couple of photo stops, I averaged around 9km an hour, which is the best I’ve done on virgin snow. The bike performed very well. It will be even better once it is able to accept the wider 5.05” tyres. The AWD on this surface is a real benefit and I can feel it pulling me out of the rough patches where I have to put on extra power. Being just above freezing, the temperatures aren’t anything like they will be in Antarctica, but it is still a good test of the bike and my ability to ride in snow conditions. I’m really benefitting from the fitness gained during my Baja ride. Camping down at the lakeside once more, we”ve been treated to a magnificent display of the Aurora Borealis, or Northern Lights. It is the best I’ve ever seen and the first time Mike and Tristan have seen it. They spent more than an hour capturing some awesome images. 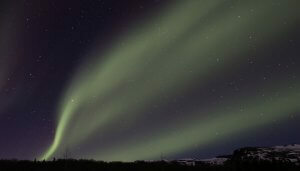 Beams of light, the result of collisions between gaseous particles in the Earth’s atmosphere with charged particles released from the sun’s atmosphere. The different colours are due to the different gases present in the atmosphere.